Public Domain: Marxists Internet Archive (2008). You may freely copy, distribute, display and perform this work; as well as make derivative and commercial works. P lease credit "Marxists Internet Archive" as your source. Comrades, five years have elapsed since the Seventeenth Party Congress. No small period, as you see. During this period the world has undergone considerable changes. States and countries, and their mutual relations, are now in many respects totally altered. For the capitalist countries this period was one of very profound perturbations in both the economic and political spheres. In the economic sphere these were years of depression, followed, from the beginning of the latter half of 1937, by a period of new economic crisis, of a new decline of industry in the United States, Great Britain and France; consequently, these were years of new economic complications. In the political sphere they were years of serious political conflicts and perturbations. A new imperialist war is already in its second year, a war waged over a huge territory stretching from Shanghai to Gibraltar and involving over five hundred million people. The map of Europe, Africa and Asia is being forcibly redrawn. The entire post-war system, the so-called regime of peace, has been shaken to its foundations. Lastly, this table shows that in Germany, who reorganized her economy on a war footing later than Italy and Japan, industry is still experiencing a certain upward trend - although a small one, it is true - corresponding to that which took place in Japan and Italy until recently. There can be no doubt that unless something unforeseen occurs, German industry must enter the same downward path as Japan and Italy have already taken. For what does placing the economy of a country on a war footing mean? It means giving industry a one-sided war direction; developing to the utmost the production of goods necessary for war and not for consumption by the population; restricting to the utmost the production and, especially, the sale of articles of general consumption - and, consequently, reducing consumption by the population and confronting the country with an economic crisis. Naturally, such an unfavourable turn of economic affairs could not but aggravate relations among the powers. The preceding crisis had already mixed the cards and intensified the struggle for markets and sources of raw materials. The seizure of Manchuria and North China by Japan, the seizure of Abyssinia by Italy - all this reflected the acuteness of the struggle among the powers. The new economic crisis must lead, and is actually leading, to a further sharpening of the imperialist struggle. It is no longer a question of competition in the markets, of a commercial war, of dumping. These methods of struggle have long been recognized as inadequate. It is now a question of a new redivision of the world, of spheres of influence and colonies, by military action. Collapse of the Post-War System of Peace Treaties. Beginning of a New Imperialist War. 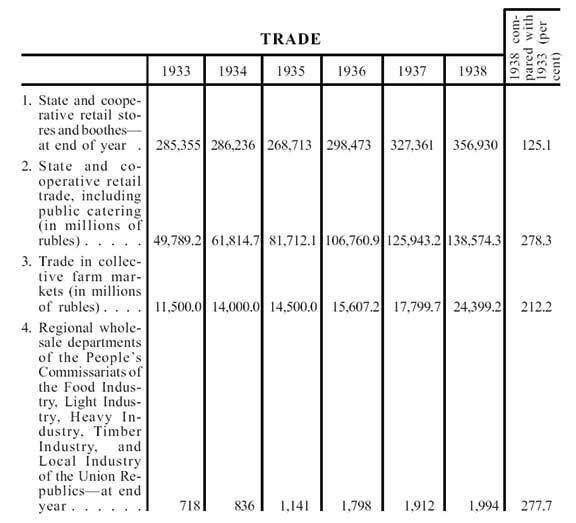 Further Progress of Industry and Agriculture. a) Industry : During the period under review our industry presented a picture of uninterrupted progress, This progress was reflected not only in an increase of output generally, but, and primarily, in the flourishing state of Socialist industry, on the one hand, and the doom of private industry on the other. In what respect are we lagging? We are still lagging economically, that is, as regards the volume of our industrial output per head of population. In 1938 we produced about 15,000,000 tons of pig iron; Great Britain produced 7,000,000 tons. It might seem that we are better off than Great Britain. 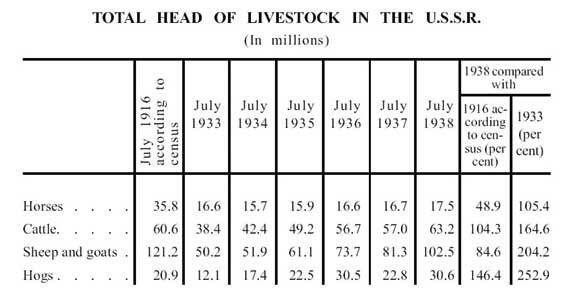 But if we divide this number of tons by the number of population we shall find that the output of pig iron per head of population in 1938 was 145 kilograms in Great Britain, and only 87 kilograms in the U.S.S.R. Or, further : in 1938 Great Britain produced 10,800,000 tons of steel and about 29,000,000,000 kilowatt-hours of electricity, whereas the U.S.S.R. produced 18,000,000 tons of steel and over 39,000,000,000 kilowatt-hours of electricity. It might seem that we are better off than Great Britain. But if we divide this number of tons and kilowatt-hours by the number of population we shall find that in 1938 in Great Britain the output of steel per head of the population was 226 kilograms and of electricity 620 kilowatt-hours, whereas in the U.S.S.R. the output of steel per head of population was only 107 kilograms, and of electricity only 233 kilowatt-hours. What is the reason for this? The reason is that our population is several times larger than that of Great Britain, and hence our requirements are greater : the Soviet Union has a population of 170,000,000, whereas Great Britain has a population of not more than 46,000,000. The economic power of a country's industry is not expressed by the volume of industrial output in general, irrespective of the size of population, but by the volume of industrial output taken in direct reference to the amount consumed per head of population. The larger a country's industrial output per head of population, the greater is its economic power; and, conversely, the smaller the output per head of population, the less is the economic power of the country and of its industry. Consequently, the larger a country's population, the greater is the need for articles of consumption, and hence the larger should be the industrial output of the country. Take, for example, the output of pig iron. In order to outstrip Great Britain economically in respect to the production of pig iron, which in 1938 amounted in that country to 7,000,000 tons, we must increase our annual output of pig iron to 25,000,000 tons. In order economically to outstrip Germany, which in 1938 produced 18,000,000 tons of pig iron in all, we must raise our annual output to 40,000,000 or 45,000,000 tons. And in order to outstrip the U.S.A. economically - not as regards the level of 1938, which was a year of crisis, and in which the U.S.A. produced only 18,800,000 tons of pig iron, but as regards the level of 1929, when the U.S.A. was experiencing an industrial boom and when it produced about 43,000,000 tons of pig iron - we must raise our annual output of pig iron to 50,000,000 or 60,000,000 tons. What do we require to outstrip the principal capitalist countries economically? First of all, we require the earnest and indomitable desire to move ahead and the readiness to make sacrifices and invest very considerable amounts of capital for the utmost expansion of our Socialist industry. Have we these requisites? We undoubtedly have! Further, we require a high technique of production and a high rate of industrial development. Have we these requisites? We undoubtedly have! Lastly, we require time. Yes, comrades, time. We must build new factories. We must train new cadres for industry. But this requires time, and no little time at that. We cannot outstrip the principal capitalist countries economically in two or three years. It will require rather more than that. Take, for example, pig iron and its production. How much time do we require to outstrip the principal capitalist countries economically in regard to the production of pig iron? When the Second Five-Year Plan was being drawn up, certain members of the old personnel of the State Planning Commission proposed that the annual output of pig iron towards the end of the Second Five-Year Plan should be fixed in the amount of sixty million tons. That means that they assumed the possibility of an average annual increase in pig iron production of ten million tons. This, of course, was sheer fantasy, if not worse. Incidentally, it was not only in regard to the production of pig iron that these comrades indulged their fantasy. They considered, for example, that during the period of the Second Five-Year Plan the annual increase of population in the U.S.S.R. should amount to three or four million persons, or even more. This was also fantasy, if not worse. But if we ignore these fantastic dreamers and come down to reality, we may consider quite feasible an average annual increase in the output of pig iron of two or two and a half million tons, bearing in mind the present state of the technique of iron smelting. The industrial history of the principal capitalist countries, as well as of our country, shows that such an annual rate of increase involves a great strain, but is quite feasible. Of particular interest is the question of the amount of grain marketed by the collective farms and state farms as compared with their gross harvests Comrade Nemchinov, the well-known statistician, has calculated that of a gross grain harvest of 5,000,000,000 poods in pre-war times, only about 1,300,000,000 poods were marketed. Thus the proportion of marketed produce of grain farming at that time was 26 per cent. 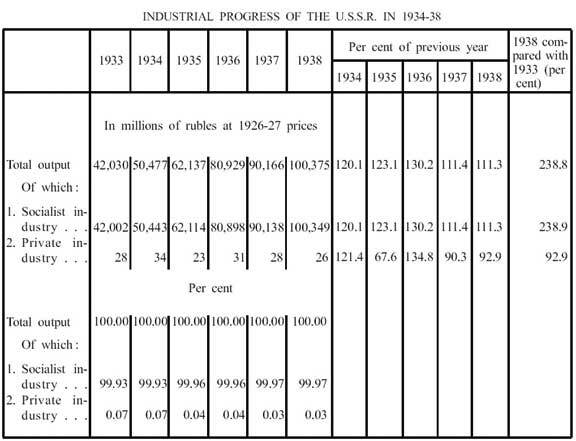 Comrade Nemchinov computes that the proportion of marketed produce to gross harvest in the years 1926-27, for example, was about 47 per cent in the case of collective and state farming, which is largescale farming, and about 12 per cent in the case of individual peasant farming. 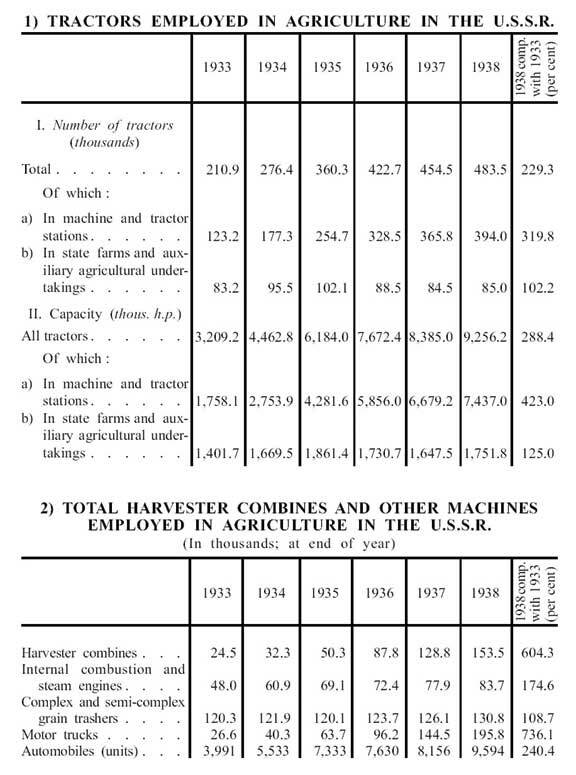 If we approach the matter more cautiously and assume the amount of marketed produce in the case of collective and state farming in 1938 to be 40 per cent of the gross harvest, we find that in the year our Socialist grain farming was able to release, and actually did release, about 2,300,000,000 poods of grain for the market, or 1,000,000,000 poods more than was marketed in prewar times. The abolition of exploitation and the consolidation of the Socialist economic system, the absence of unemployment, with its attendant poverty, in town and country, the enormous expansion of industry and the steady growth in the number of workers, the increase in the productivity of labour of the workers and collective farmers, the securement of the land to the collective farms in perpetuity, and the vast number of first-class tractors and agricultural machines supplied to the collective farms - all this has created effective conditions for a further rise in the standard of living of the workers and peasants. In its turn, the improvement in the standard of living of the workers and peasants has naturally led to an improvement in the standard of living of the intelligentsia, who represent a considerable force in our country and serve the interests of the workers and the peasants. Now it is no longer a question of finding room in industry for unemployed and homeless peasants who have been set adrift from their villages and live in fear of starvation - of giving them jobs out of charity. The time has long gone by when there were such peasants in our country. And this is a good thing, of course, for it testifies to the prosperity of our countryside. If anything, it is now a question of asking the collective farms to comply with our request and to release, say, one and a half million young collective farmers annually for the needs of our expanding industry. The collective farms, which have already become prosperous, should bear in mind that if we do not get this assistance from them it will be very difficult to continue the expansion of our industry, and that if we do not expand our industry we will not be able to satisfy the peasants' growing demand for consumers' goods. The collective farms are quite able to meet this request of ours, since the abundance of machinery in the collective farms releases a portion of the rural workers, who, if transferred to industry, could be of immense service to our whole national economy. As regards the cultural standard of the people, the period under review has been marked by a veritable cultural revolution. 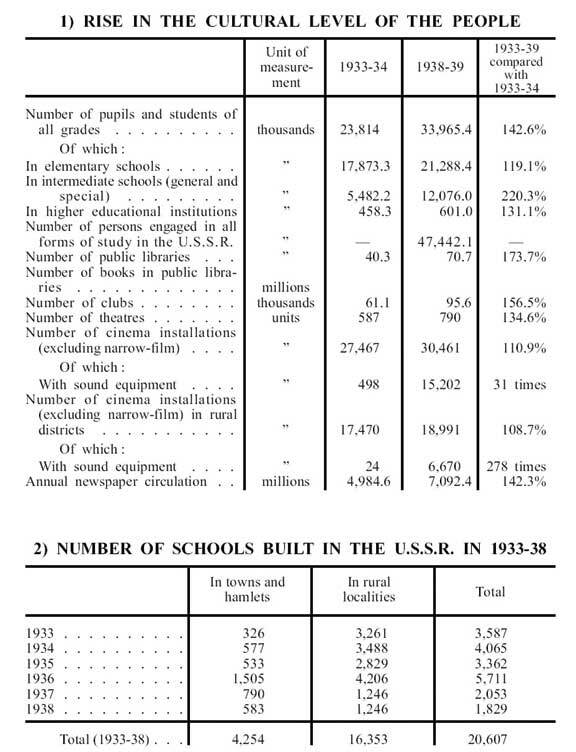 The introduction of universal compulsory elementary education in the languages of the various nations of the U.S.S.R., an increasing number of schools and scholars of all grades, an increasing number of college-trained experts, and the creation and growth of a new intelligentsia, a Soviet intelligentsia - such is the general picture of the cultural advancement of our people. Nor could it be otherwise. The firm establishment of the Socialist system in all branches of national economy, the progress of industry and agriculture, the rising material standard of the people, the rising cultural standard of the people and their increasing political activity - all this, accomplished under the guidance of the Soviet power, could not but lead to the further consolidation of the Soviet system. The feature that distinguishes Soviet society today from any capitalist society is that it no longer contains antagonistic, hostile classes; that the exploiting classes have been eliminated, while the workers, peasants and intellectuals, who make up Soviet society, live and work in friendly collaboration. While capitalist society is torn by irreconcilable contradictions between workers and capitalists and between peasants and landlords - resulting in its internal instability - Soviet society, liberated from the yoke of exploitation, knows no such contradictions, is free of class conflicts, and presents a picture of friendly collaboration between workers, peasants and intellectuals. It is this community of interest which has formed the basis for the development of such motive forces as the moral and political unity of Soviet society, the mutual friendship of the nations of the U.S.S.R. and Soviet patriotism. It has also been the basis for the Constitution of the U.S.S.R. adopted in November 1936, and for the complete democratization of the elections to the supreme organs of the country. Certain foreign pressmen have been talking drivel to the effect that the purging of Soviet organizations of spies, assassins and wreckers like Trotsky, Zinoviev, Kamenev, Yakir, Tukhachevsky, Rosengoltz, Bukharin and other fiends has "shaken" the Soviet system and caused its "demoralization." One can only laugh at such cheap drivel. How can the purging of Soviet organizations of noxious and hostile elements shake and demoralize the Soviet system? This Trotsky- Bukharin bunch of spies, assassins and wreckers, who kow-towed to the foreign world, who were possessed by a slavish instinct to grovel before every foreign bigwig, and, who were ready to enter his employ as a spy - this handful of people who did not understand that the humblest Soviet citizen, being free from the fetters of capital, stands head and shoulders above any high-placed foreign bigwig whose neck wears the yoke of capitalist slavery - who needs this miserable band of venal slaves, of what value can they be to the people, and whom can they "demoralize"? In 1937 Tukhachevsky, Yakir, Uborevich and other fiends were sentenced to be shot. After that, the elections to the Supreme Soviet of the U.S.S.R. were held. In these elections, 98.6 per cent of the total vote was cast for the Soviet power. At the beginning of 1938 Rosengoltz, Rykov, Bukharin and other fiends were sentenced to be shot. After that, the elections to the Supreme Soviets of the Union Republics were held. In these elections 99.4 per cent of the total vote was cast for the Soviet power. Where are the symptoms of "demoralization," we would like to know, and why was this "demoralization" not reflected in the results of the elections? When it had smashed the enemies of the people and purged the Party and Soviet organizations of degenerates, the Party became still more united in its political and organizational work and rallied even more solidly around its Central Committee (Stormy applause. All the delegates rise and cheer the speaker. The strengthening of the Party and of its leading bodies during the period under review proceeded chiefly along two lines : along the line of regulating the composition of the Party, ejecting unreliable elements and selecting the best elements, and along the line of dividing up the organizations, reducing their size, and bringing the leading bodies closer to the concrete, day-to-day work of the lower bodies. There were 1,874,488 Party members represented at the Seventeenth Party Congress. Comparing this figure with the number of Party members represented at the preceding congress, the Sixteenth Party Congress, we find that in the interval between these two congresses 600,000 new members joined the Party. The Party could not but feel that in the conditions prevailing in 1930-33 such a mass influx into its ranks was an unhealthy and undesirable expansion of its membership. The Party knew that its ranks were being joined not only by honest and loyal people, but also by chance elements and careerists, who were seeking to utilize the badge of the Party for their own personal ends. The Party could not but know that its strength lay not only in the size of its membership, but, and above all, in the quality of its members. This raised the question of regulating the composition of the Party. It was decided to continue the purge of Party members and candidate members begun in 1933; and the purge actually was continued until May 1935. It was further decided to suspend the admission of new members into the Party; and the admission of new members actually was suspended until September 1936, the admission of new members being resumed only on November 1, 1936. Further, in connection with the dastardly murder of Comrade Kirov, which showed that there were quite a number of suspicious elements in the Party, it was decided to undertake a verification of the records of Party members and an exchange of old Party cards for new ones, both these measures being completed only in September 1936. Only after this was the admission of new members and candidate members into the Party resumed. As a result of all these measures, the Party succeeded in weeding out chance, passive, careerist and directly hostile elements, and in selecting the most staunch and loyal people. It cannot be said that the purge was not accompanied by grave mistakes. There were unfortunately more mistakes than might have been expected. Undoubtedly, we shall have no further need of resorting to the method of mass purges. Nevertheless, the purge of 1933-36 was unavoidable and its results, on the whole, were beneficial. The number of Party members represented at this, the Eighteenth Congress is about 1,600,000, which is 270,000 less than were represented at the Seventeenth Congress. But there is nothing bad in that. On the contrary, it is all to the good, for the Party strengthens itself by clearing its ranks of dross. Our Party is now somewhat smaller in membership, but on the other hand it is better in quality. It cannot be said that the division of organizations is already over. Most likely it will be carried further. But, however that may be, it is already yielding good results both in the improvement of the day-to-day leadership of the work and in bringing the leadership itself closer to the concrete work of the lower bodies. I need not mention that the division of organizations has made it possible to promote hundreds and thousands of new people to leading posts. The Party cadres constitute the commanding staff of the Party; and since our Party is in power, they also constitute the commanding staff of the leading organs of state. After a correct political line has been worked out and tested in practice, the Party cadres become the decisive force in the work of guiding the Party and the state. A correct political line is, of course, the primary and most important thing. But that in itself is not enough. A correct political line is not needed as a declaration, but as something to be carried into effect. But in order to carry a correct political line into effect, we must have cadres, people who understand the political line of the Party, who accept it as their own line, who are prepared to carry it into effect, who are able to put it into practice and are capable of answering for it, defending it and fighting for it. Failing this, a correct political line runs the risk of being purely nominal. Particularly important in this respect is the bold and timely promotion of new and young cadres. It seems to me that our people are not quite clear on this point yet. Some think that in selecting people we must chiefly rely on the old cadres. Others, on the contrary, think that we must rely chiefly on the young cadres. It seems to me that both are mistaken, The old cadres, of course, represent a valuable asset to the Party and the state. They possess what the young cadres lack, namely, tremendous experience in leadership, a schooling in Marxist-Leninist principles, knowledge of affairs, and a capacity for orientation. There is hardly need to dwell on the cardinal importance of Party propaganda, of the Marxist-Leninist training of our people. I am referring not only to Party functionaries. I am also referring to the workers in the Young Communist League, trade union, trade, cooperative, economic, state, educational, military and other organizations. The work of regulating the composition of the Party and of bringing the leading bodies closer to the activities of the lower bodies may be organized satisfactorily; the work of promoting, selecting and allocating cadres may be organized satisfactorily; but, with all this, if our Party propaganda for some reason or other goes lame, if the Marxist-Leninist training of our cadres begins to languish, if our work of raising the political and theoretical level of these cadres flags, and the cadres themselves cease on account of this to show interest in the prospect of our further progress, cease to understand the truth of our cause and are transformed into narrow plodders with no outlook, blindly and mechanically carrying out instructions from above - then our entire state and Party work must inevitably languish. It must be accepted as an axiom that the higher the political level and the Marxist-Leninist knowledge of the workers in any branch of state Party work the better and more fruitful will be the work itself, and the more effective the results of the work; and, vice versa, the lower the political level of the workers, and the less they are imbued with the knowledge of Marxism-Leninism, the greater will be the likelihood of disruption and failure in the work, of the workers themselves becoming shallow and deteriorating into paltry plodders, of their degenerating altogether. It may be confidently stated that if we succeeded in training the cadres in all branches of our work ideologically, and in schooling them politically, to such an extent as to enable them easily to orientate themselves in the internal and international situation; if we succeeded in making them quite mature Marxist-Leninists capable of solving the problems involved in the guidance of the country without serious error, we would have every reason to consider nine-tenths of our problems already settled. And we certainly can accomplish this, for we have all the means and opportunities for doing so. Measures for improving the work of propaganda and of the Marxist-Leninist training of cadres have been discussed many times by the Central Committee of the C.P.S.U.(B.) jointly with propagandists from various regional Party organizations, The publication, in September 1938, of the "History of the C.P.S.U.(B.) - Short Course" was taken into account in this connection. It was ascertained that the publication of the "History of the C.P.S.U.(B.)" had given a new impetus to Marxist-Leninist propaganda in our country. The results of the work of the Central Committee of the C.P.S.U.(B.) have been published in its decision, "On the Organization of Party Propaganda in Connection with the Publication of the History of the C.P.S.U.(B.) - Short Course." It is sometimes asked "We have abolished the exploiting classes; there are no longer any hostile classes in the country; there is nobody to suppress; hence there is no more need for the state; it must die away. - Why then do we not help our Socialist state to die away? Why do we not strive to put an end to it? Is it not time to throw out all this rubbish of a state?" Or further : "The exploiting classes have already been abolished in our country; Socialism has been built in the main; we are advancing towards Communism. Now, the Marxist doctrine of the state says that there is to be no state under Communism. - Why then do we not help our Socialist state to die away? Is it not time we relegated the state to the museum of antiquities? These questions show that those who ask them have conscientiously memorized certain propositions contained in the doctrine of Marx and Engels about the state. But they also show that these comrades have failed to understand the essential meaning of this doctrine; that they have failed to realise in what historical conditions the various propositions of this doctrine were elaborated; and, what is more, that they do not understand present-day international conditions, have overlooked the capitalist encirclement and the dangers it entails for the Socialist country. These questions not only betray an underestimation of the capitalist encirclement, but also an underestimation of the role and significance of the bourgeois states and their organs, which send spies, assassins and wreckers into our country and are waiting for a favourable opportunity to attack it by armed force. They likewise betray an underestimation of the role and significance of our Socialist state and of its military, punitive and intelligence organs, which are essential for the defence of the Socialist land from foreign attack. It must be confessed that the comrades mentioned are not the only ones to sin in this underestimation. All the Bolsheviks, all of us without exception, sin to a certain extent in this respect. Is it not surprising that we learned about the espionage and conspiratorial activities of the Trotskyite and Bukharinite leaders only quite recently, in 1937 and 1938, although, as the evidence shows, these gentry were in the service of foreign espionage organizations and carried on conspiratorial activities from the very first days of the October Revolution? How could we have failed to notice so grave a matter? How are we to explain this blunder? The usual answer to this question is that we could not possibly have assumed that these people could have fallen so low. But that is no explanation, still less is it a justification : for the blunder was a blunder. How is this blunder to be explained? It is to be explained by an underestimation of the strength and consequence of the mechanism of the bourgeois states surrounding us and of their espionage organs, which endeavour to take advantage of people's weaknesses, their vanity, their slackness of will, to enmesh them in their espionage nets and use them to surround the organs of the Soviet state. It is to be explained by an underestimation of the role and significance of the mechanism of our Socialist state and of its intelligence service, by an underestimation of this intelligence service, by the twaddle that an intelligence service in a Soviet state is an unimportant trifle, and that the Soviet intelligence service and the Soviet state itself will soon have to be relegated to the museum of antiquities. It arose owing to the fact that certain of the general propositions in the Marxist doctrine of the state were incompletely worked out and inadequate. (1) if we study the Socialist state only from the angle of the internal development of the country, abstracting ourselves in advance from the international factor, isolating, for the convenience of investigation, the country and the state from the international situation; or (2) if we assume that Socialism is already victorious in all countries, or in the majority of countries, that a Socialist encirclement exists in stead of a capitalist encirclement, that there is no more danger of foreign attack, and that there is no more need to strengthen the army and the state. Well, but what if Socialism has been victorious only in one country, taken singly, and if, in view of this, it is quite impossible to abstract oneself from international conditions - what then? Engels' formula does not furnish an answer to this question. As a matter of fact, Engels did not set himself this question, and therefore could not have given an answer to it. Engels proceeds from the assumption that Socialism has already been victorious in all countries, or in a majority of countries, more or less simultaneously. Consequently, Engels is not here investigating any specific Socialist state of any particular country, but the development of the Socialist state in general, on the assumption that Socialism has been victorious in a majority of countries - according to the formula : "Assuming that Socialism is victorious in a majority of countries, what changes must the proletarian, Socialist state undergo?" Only this general and abstract character of the problem can explain why in his investigation of the question of the Socialist state Engels completely abstracted himself from such a factor as international conditions, the international situation. But we can and should expect of the Marxists-Leninists of our day that they do not confine themselves to learning by rote a few general tenets of Marxism; that they delve deeply into the essence of Marxism; that they learn to take account of the experience gained in the twenty years of existence of the Socialist state in our country; that, lastly, they learn, with the use of this experience and with knowledge of the essence of Marxism, to apply the various general theses of Marxism concretely, to lend them greater precision and improve them. The state arose because society split up into antagonistic classes; it arose in order to keep in restraint the exploited majority in the interests of the exploiting minority. The instruments of state authority have been mainly concentrated in the army, the punitive organs, the espionage service, the prisons. Two basic functions characterize the activity of the state: at home (the main function), to keep in restraint the exploited majority; abroad (not the main function), to extend the territory of its class, the ruling class, at the expense of the territory of other states, or to defend the territory of its own state from attack by other states. Such was the case in slave society and under feudalism. Such is the case under capitalism. In order to overthrow capitalism it was not only necessary to remove the bourgeoisie from power, it was not only necessary to expropriate the capitalists, but also to smash entirely the bourgeois state machine and its old army, its bureaucratic officialdom and its police force, and to substitute for it a new, proletarian form of state, a new, Socialist state. And that, as we know, is exactly what the Bolsheviks did. But it does not follow that the new proletarian state may not preserve certain functions of the old state, changed to suit the requirements of the proletarian state. Still less does it follow that the forms of our Socialist state must remain unchanged, that all the original functions of our state must be fully preserved in future. As a matter of fact, the forms of our state are changing and will continue to change in line with the development of our country and with the changes in the international situation. The first phase was the period from the October revolution to the elimination of the exploiting classes. The principal task in that period was to suppress the resistance of the overthrown classes, to organize the defence of the country against the attacks of the interventionists, to restore industry and agriculture, and to prepare the conditions for the elimination of the capitalist elements. Accordingly, in this period our state performed two main functions. The first function was to suppress the overthrown classes inside the country. In this respect our state bore a superficial resemblance to previous states whose functions had also been to suppress recalcitrants, with the fundamental difference, however, that our state suppressed the exploiting minority in the interests of the labouring majority, while previous states had suppressed the exploited majority in the interests of the exploiting minority. The second function was to defend the country from foreign attack. In this respect it likewise bore a superficial resemblance to previous states, which also undertook the armed defence of their countries, with the fundamental difference, however, that our state defended from foreign attack the gains of the labouring majority, while previous states in such cases defended the wealth and privileges of the exploiting minority. Our state had yet a third function : this was the work of economic organization and cultural education performed by our state bodies with the purpose of developing the infant shoots of the new, Socialist economic system and re-educating the people in the spirit of Socialism. But this new function did not attain to any considerable development in that period. The second phase was the period from the elimination of the capitalist elements in town and country to the complete victory of the Socialist economic system and the adoption of the new Constitution. The principal task in this period was to establish the Socialist economic system all over the country and to eliminate the last remnants of the capitalist elements, to bring about a cultural revolution, and to form a thoroughly modern army for the defence of the country. And the functions of our Socialist state changed accordingly. The function of military suppression inside the country ceased, died away; for exploitation had been abolished, there were no more exploiters left, and so there was no one to suppress. In place of this function of suppression the state acquired the function of protecting Socialist property from thieves and pilferers of the people's property. The function of defending the country from foreign attack fully remained; consequently, the Red Army and the Navy also fully remained, as did the punitive organs and the intelligence service, which are indispensable for the detection and punishment of the spies, assassins and wreckers sent into our country by foreign espionage services. The function of economic organization and cultural education by the state organs also remained, and was developed to the full. Now the main task of our state inside the country is the work of peaceful economic organization and cultural education. As for our army, punitive organs, and intelligence service, their edge is no longer turned to the inside of the country, but to the outside, against external enemies. In the old days, under capitalism, before the revolution, the intelligentsia consisted primarily of members of the propertied classes - noblemen, manufacturers, merchants, kulaks and so on. Some members of the intelligentsia were sons of small tradesmen, petty officials, and even of peasants and workingmen, but they did not and could not play a decisive part. The intelligentsia as a whole depended for their livelihood on the propertied classes and ministered to the propertied classes. Hence it is easy to understand the mistrust, often bordering on hatred, with which the revolutionary elements of our country and above all the workers regarded the intellectuals. True, the old intelligentsia produced some courageous individuals, handfuls of revolutionary people who adopted the standpoint of the working class and completely threw in their lot with the working class. But such people were all too few among the intelligentsia, and they could not change the complexion of the intelligentsia as a whole. Matters with regard to the inteliigentsia have undergone a fundamental change, however, since the October Revolution, since the defeat of the foreign armed intervention, and especially since the victory of industrialization and collectivization, when the abolition of exploitation and the firm establishment of the Socialist economic system made it really possible to give the country a new constitution and to put it into effect. The most influential and qualified section of the old intelligentsia broke away from the main body in the very first days of the October Revolution, proclaimed war on the Soviet government, and joined the ranks of the saboteurs. They met with welldeserved punishment for this; they were smashed and dispersed by the organs of Soviet power. Subsequently the majority of those that survived were recruited by the enemies of our country as wreckers and spies, and thus were expunged by their own deeds from the ranks of the intellectuals. 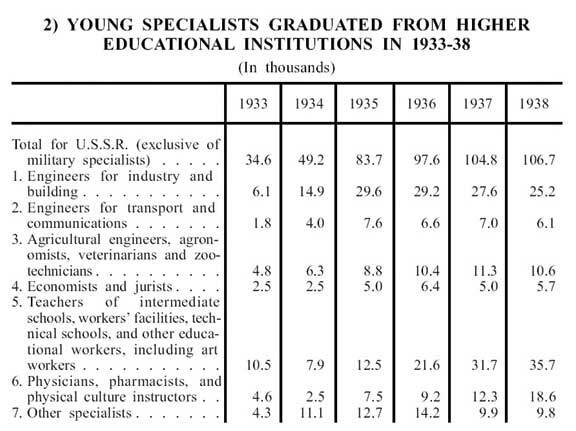 Another section of the old intelligentsia, less qualified but more numerous, long continued to mark time, waiting for "better days"; but then, apparently giving up hope, decided to go and serve and to live in harmony with the Soviet government. The greater part of this group of the old intelligentsia are well on in years and are beginning to go out of commission. A third section of the old intelligentsia, mainly comprising its rank-and-file, and still less qualified than the section just mentioned, joined forces with the people and supported the Soviet government. It needed to perfect its education, and it set about doing so in our universities. But parallel with this painful process of differentiation and breakup of the old intelligentsia there went on a rapid process of formation, mobilization and mustering of forces of a new intelligentsia. Hundreds of thousands of young people coming from the ranks of the working class, the peasantry and the working intelligentsia entered the universities and technical colleges, from which they emerged to reinforce the attenuated ranks of the intelligentsia. They infused fresh blood into it and reanimated it in a new, Soviet spirit. They radically changed the whole aspect of the intelligentsia, moulding it in their own form and image. The remnants of the old intelligentsia were dissolved in the new, Soviet intelligentsia, the intelligentsia of the people. There thus arose a new, Soviet intelligentsia, intimately bound up with the people and, for the most part, ready to serve them faithfully and loyally. The old theory about the intelligentsia, which taught that it should be treated with distrust and combated, fully applied to the old, pre-revolutionary intelligentsia, which served the landlords and capitalists. This theory is now out-of-date and does not fit our new, Soviet intelligentsia. Our new intelligentsia demands a new theory, a theory teaching the necessity for a cordial attitude towards it, solicitude and respect for it, and cooperation with it in the interests of the working class and the peasantry. I have sketched in broad outline the path traversed by our Party during the period under review. The results of the work of the Party and of its Central Committee during this period are well known. There have been mistakes and shortcomings in our work. The Party and the Central Committee did not conceal them and strove to correct them. There have also been important successes and big achievements, which must not be allowed to turn our heads. The bourgeoisie of all countries asserts that, having destroyed the old bourgeois system, the working class is incapable of building anything new to replace the old. The working class of our country has proved in practice that it is quite capable not only of destroying the old system but of building anew and better system, a Socialist system, a system, moreover, to which crises and unemployment are unknown, The bourgeoisie of all countries asserts that the peasantry is incapable of taking the path of Socialism. The collective farm peasants of our country have proved in practice that they can do so quite successfully. The chief endeavour of the bourgeoisie of all countries and of its reformist hangers-on is to kill in the working class faith in its own strength, faith in the possibility and inevitability of its victory, and thus to perpetuate capitalist slavery. For the bourgeoisie knows that if capitalism has not yet been overthrown and still continues to exist, it owes it not to its own merits, but to the fact that the proletariat has still not enough faith in the possibility of its victory. It cannot be said that the efforts of the bourgeoisie in this respect have been altogether unsuccessful. It must be confessed that the bourgeoisie and its agents among the working class have to some extent succeeded in poisoning the minds of the working class with the venom of doubt and scepticism.